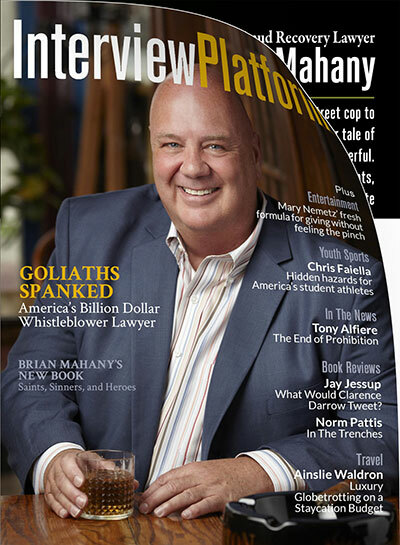 Brian Mahany's evolution from New Orleans street cop to America's newest Billion Dollar Lawyer is a 20 year tale of justice achieved for real people against the super powerful. He chronicles his string of David v Goliath wins in Saints, Sinners & Heroes: Covert Ops in the War Against the C-Suite Mafia. Staff: You have enjoyed several billion dollar whistleblower cases including several cases against banks and mortgage companies. That makes you somewhat of a John Grisham-style hero for the little guy. How does that feel? Brian Mahany: It’s great to finally see some justice in the mortgage mess that hurt all of us but the real heroes are the whistleblowers who risked their jobs, career and reputations to stand up against corruption and fraud. The thousands of special agents, auditors, bank examiners and prosecutors working behind the scenes are also real heroes in these false claims act cases. Staff: Why did you write Saints, Sinners & Heroes? Brian Mahany: America is in trouble. We face a crisis of confidence. Our biggest threat isn’t disease or terrorism, it’s apathy. We are frustrated with government, frustrated with the economy and most people feel powerless to make a difference. Whistleblowers – and Sinners Saints and Heroes is all about whistleblowers – are ordinary Americas who wake up one morning and decide to take a stand. Collectively, they have helped the government collect tens of billions in recent years and have empowered all of us. In many cases, they have also made us safer. Literally. America desperately needs heroes and we have them right in our midst. Their stories need to be told. That is why I wrote the book. Staff: So what is a whistleblower lawyer? Brian Mahany: A whistleblower lawyer is a gatekeeper. To qualify for a whistleblower award under the federal False Claims Act, an actual lawsuit has to be filed under seal in federal court. Much work goes into investigating claims, researching the law and drafting the complaint. Once filed, the suit needs to be “sold” to the government. The Justice Department and federal agencies have a full plate. They receive hundreds of tips per day and can’t investigate all of them. Our job as whistleblower attorneys is to package these cases, provide key information to get the government’s investigation started, make the case understandable and explain why it is worthwhile to pursue. The popular story today is how the SEC was warned more than once about Bernie Madoff yet did nothing. It’s easy to affix blame after the fact. A good whistleblower lawyer will make sure that the right folks get the necessary information and act on it. Simply calling a toll-free hot line is probably not going to carry the day, particularly if the crime or fraud is complex. We also work hard to make sure that our clients – often called “relators” by the courts – receive the maximum whistleblower awards possible and as you’ve seen they can be in the millions, sometimes tens of millions, of dollars. A few whistleblowers have received over $100 million. If the government refuses to take a case, it then falls on our shoulders to potentially take the case ourselves. That is a big responsibility. Staff: Tell us about some of your False Claims Act cases. Brian Mahany: Our biggest case is still under seal. Billions of dollars but we can’t discuss it yet. Several more huge cases are still being investigated by the government. There are plenty of cases we can discuss, however. One of largest is HUD’s case against Allied Home Mortgage, a $2.4 billion claim involving bad mortgage loans and mortgage fraud. We represent the whistleblower in that case, a former branch manager who stepped up after watching thousands of bad loans get approved and HUD rules violated on a daily basis. Our big case against the world’s largest mutual fund company, Vanguard, was declined by the New York State Attorney General. We have put together a coalition of great lawyers and even a law professor to prosecute that case privately. Much of what we are working on remains under seal. False Claims Act, SEC and IRS whistleblower cases are generally investigated in secret. We can’t talk about those cases until they are unsealed. I can tell you, however, that these cases can involve a wide variety of programs including Medicare fraud and government contracts. Staff: Your book is titled Saints Sinners & Heroes – who are the Saints? Brian Mahany: The saints are the women and men of the Department of Justice as well as agents and auditors from dozens of agencies including the FBI, Department of Transportation, HUD, Federal Housing Finance Agency, Medicare, Defense Department… if there is a government program out there I guarantee that someone is illegally trying to take advantage of it. If whistleblowers are the heroes who come forward to report the fraud, the saints are the ones sifting through millions of pages of documents trying to build a case. Staff: Who are the Sinners? Brian Mahany: I think we all know the answer to this question. The sinners are those who rip off taxpayers and the government. Some folks think that ripping off the government is a victimless crime. It isn’t. Taxpayers foot the bill for every fraud against the government. Sometimes the stakes are even higher. There are millions of Americans struggling to make ends meet and receive healthcare. Look at the beleaguered Veterans Administration that doesn’t have enough resources to take care of vets. Unfortunately, there are companies and individuals ripping off the VA meaning that well-deserving vets must wait even longer for care. Many times the harm caused by these sinners goes well beyond money. We saw a medical group performing unnecessary cardiac surgical procedures simply to collect more Medicare money. Cutting people open and exposing patients to months of pain and the risk of infection and death simply to get a few extra dollars. Those folks belong in jail. One of the areas we are currently investigating is embassy security. There are handful of contractors earning billions for providing security to U.S. embassies and consulates around the world. Yet a recent Inspector General’s report said some of these companies aren’t doing proper background checks or training. This is scary stuff. Staff: Tell us more about these whistleblower heroes. Brian Mahany: Doctors and billing clerks who stand up against shady hospital billing practices, loan underwriters who expose bad loan practices, construction foremen who blow the whistle on bridges being built with inferior steel... these are ordinary folks who decided to do something truly extraordinary. They risk their jobs, friends and careers to do what is right and with no guarantee that they will receive a penny. Our whistleblower laws let ordinary people wield the power of the government and bring an actual lawsuit against wrongdoers. How often have you heard someone say, “They ought to do something about that.” Whistleblowers are the folks that actually do something. It is easy to say that the government should be doing these things. As both a former agent and prosecutor I can say that government can only take action when they have a case. Random audits are not very effective for finding fraud. To truly be effective, prosecutors need someone on the inside. Whistleblowers fill that role. Staff: What do you hope the book will accomplish? Brian Mahany: The media does a great job of reporting these multibillion dollar settlements but few Americans know the real story behind many of these cases. Whistleblowers are unsung heroes. The goal of this book is to tell some of their stories and get others to come forward; to empower others to make a difference. Staff: What is the next big trend in whistleblower cases? Brian Mahany: Great question. The biggest cases from the mortgage and housing meltdown are behind us but that doesn’t mean banks are behaving. We hear daily horror stories from folks facing foreclosure and trying to modify their mortgages. That will be the next wave of cases. Embassy security contracts, private prisons and private prison healthcare appears to be rife with fraud. We would like to see more cases under the Buy America and Buy American acts. Those cases mandate quality standards for buildings, structures and bridges built with government dollars. Of course, Medicare fraud is a perennial problem. Staff: Where did these whistleblower programs originate? Brian Mahany: The oldest whistleblower programs are the IRS whistleblower program and the federal False Claims Act. The latter dates to the Civil War. Seriously. Back in the 1860’s America was at war. The federal government was stretched thin and virtually broke. Unscrupulous contractors tried to profit by selling the Union Army defective goods. Unfortunately, the federal government was stretched too thin to take these companies to task. Enter Abraham Lincoln and Congress. The False Claims Act allows ordinary Americans with inside information about fraud involving a government program to file a suit in the name of the government. The suit is filed under seal meaning it remains secret while the government investigates. Assuming there really is a case, either the government or the whistleblower lawyer can then prosecute the case once the seal is lifted. For his or her efforts, the whistleblower receives 15 to 30% of whatever the government collects. The IRS whistleblower program has also been around for many decades. It received a big boost from Congress in 2007 which makes it a much more viable program. More recently, Congress has enacted an SEC program and the Financial Institutions Reform Recovery and Enforcement Act – FIRREA – that also pay substantial awards.